“Hey, hey simmer down/They say we’re too young to amount to anything else/But look around we work too damn hard for this just to give it up now” declare 5 Seconds of Summer, the latest power pop band to crash onto U.S. airwaves with the breakout hit “She Looks So Perfect.” It may sound a bit daring as a mantra for a new band with members ranging in age from 18-20, but seems aptly worded judging from the young band’s recent accomplishments. Hailing all the way from Australia, the 4-piece band has been making its presence known in a big way as its self-titled full-length debuted atop the Billboard 200 album chart, after managing to sell over 259k copies upon its first week of release. 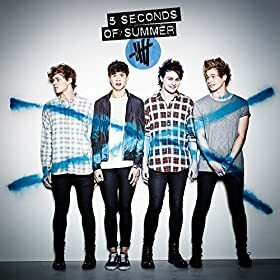 While proclaiming heavy influences from Blink-182 to Nirvana, 5SOS’ debut album sounds eerily like someone emulsified albums by Green Day, Sum 41, and BBMak in a blender and poured out an irresistibly catchy alt-rock, pop-punk smoothie. While many may be quick to cast them aside as just another boy band, 5 Seconds of Summer successfully differentiate themselves from the pack by writing their own songs, playing their own instruments, and sharing lead vocal duties. Upon first listen, there’s no denying the band members have obviously paid attention to their musical heroes and learned how to write seductive hooks syncopated with audacious power chords. The bulk of the Aussie band’s debut was produced by writer/producer Steve Robson (known for his work with everyone from Busted to James Blunt) alongside Goldfinger lead singer John Feldman. Ultimately, you won’t find anything here that hasn’t been tried before, but it’s awfully refreshing to hear guitar-driven pop/rock again amongst the heavy beats currently dominating Top 40 radio. Armed with hit singles “Don’t Stop” and the current “Amnesia,” the boys from down under have been busy pressing the flesh since invading American shores. During their current U.S. press junket, the band mates successfully managed to juggle their duties as opening act for One Direction’s Where We Are World Tour, while simultaneously selling out Los Angeles’ famed arena, The Forum, in just 45 minutes. However, stateside 5ers will have to wait until next summer before 5SOS launches its own Rock out with Your Socks out North American headlining tour, which is set to kick off on July 17, 2015 in Las Vegas.